Why would an atheist care to live one moment longer in a broken universe where one is merely rearranged pond scum and all you have to look forward to is … death, which can be around any corner? Are you tired of all the evil associated with the philosophy of atheism—Stalin, Hitler, Pol Pot, and so on? After all, most murderers, tyrants, and rapists are not biblical Christians, and most have rejected the God of the Bible. Even if they claim to believe in the God of the Bible, they are not really living like a true Christ follower (who strives to follow God’s Word), are they? 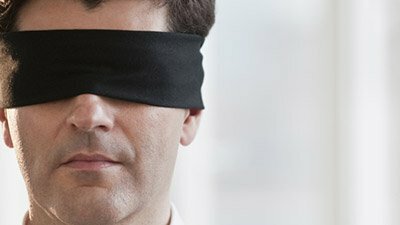 Do you feel conflicted about the fact that atheism has no basis in morality (i.e., no absolute right and wrong; no good, no bad?) If someone stabs you in the back, treats you like nothing, steals from you, or lies to you, it doesn’t ultimately matter in an atheistic worldview where everything and everyone are just chemical reactions doing what chemicals do. And further, knowing that you are essentially no different from a cockroach in an atheistic worldview (since people are just animals) must be disheartening. Do you feel like you need a weekend to recoup, even though a weekend is really meaningless in an atheistic worldview—since animals, like bees, don’t take a day of rest or have a weekend? So why should atheists? Why borrow a workweek and weekend that comes from the pages of Scriptures, which are despised by atheists? Weeks and weekends come from God creating in six literal days and resting for a literal day; and then the Lord Jesus resurrected on the first day of the week (Sunday). And why look forward to time off for a holiday (i.e., holy day), when nothing is holy in an atheistic worldview? For professing atheists, these questions can be overwhelming to make sense of within their worldview. And further, within an atheistic worldview, atheists must view themselves as God. Essentially, atheists are claiming to be God. Instead of saying there may not be a God, they say there is no God. To make such a statement, they must claim to be omniscient (which is an essential attribute of the God of the Bible) among other attributes of God as well.1 So, by saying there is no God, the atheist refutes his own position by addressing the question as though he or she were God! 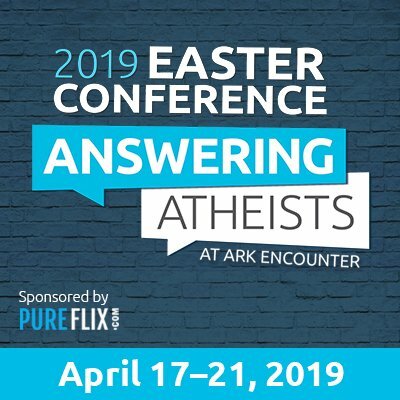 Do you feel conflicted about proselytizing the faith of atheism, since if atheism were true then who cares about proselytizing? Let’s face it, life seems tough enough as an atheist without having to deal with other major concerns like not having a basis to wear clothes, or no basis for marriage, no consistent reason to be clean (snails don’t wake up in the morning and clean themselves or follow other cleanliness guidelines based on Levitical laws), and no objective reason to believe in love. Are you weary of looking for evidence that contradicts the Bible’s account of creation and finding none? Do the assumptions and inconsistencies of dating methods weigh on your conscience when they are misrepresented as fact? Where do you suppose those missing links have gone into hiding? Surely the atheist sees the folly and hopelessness of believing that everything came from nothing. In fact, why would an atheist care to live one moment longer in a broken universe where one is merely rearranged pond scum and all you have to look forward to is … death, which can be around any corner? And in 467 trillion years, no one will care one iota about what you did or who you were or how and when you died—because death is the ultimate “hero” in an atheistic, evolutionary worldview. Of course, as a Christian I disagree, and I have a basis to see you as having value. 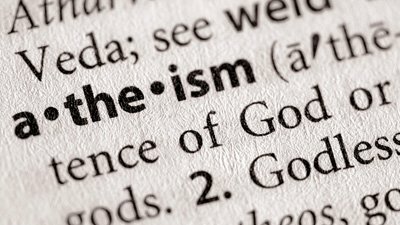 I invite you to reconsider that the false religion of atheism is simply that. I’m here to tell you that atheism is a lie ( Romans 1:25 ).2 As a Christian, I understand that truth exists because God exists, who is the Truth ( John 14:6 ),3 and we are made in His image.4 Unlike an atheist, whose worldview doesn’t allow him to believe in truth or lies, the Bible-believer has a foundation that enables him to speak about truth and lies. This is because believers in God and His Word have an authority, the ultimate authority on the subject, to base statements upon. Atheists have no consistent reason to proselytize their faith, but Christians like me do have a reason—Jesus Christ, who is the Truth, commands us to ( Matthew 28:19 ).12 We want to see people repent of their evil deeds and be saved from death ( Acts 8:22; 17:30 ).13 What a wonderful joy ( Luke 15:10 )14. Where atheists have no basis for logic and reason (or even for truth, since truth is immaterial), Bible believers can understand that mankind is made in the image of a logical and reasoning God who is the truth. Hence, Christians can make sense of things because in Christ are “ hidden all the treasures of wisdom and knowledge ” ( Colossians 2:3 ).15 Christians also have a basis to explain why people sometimes don’t think logically due to the Fall of mankind in Genesis 3. The most logical response is to give up atheism and receive Jesus Christ as Lord and Savior to rescue you from sin and death ( Romans 10:13 ).16 Instead of death, God promises believers eternal life ( 1 John 2:25 ; John 10:28 )17 and in 467 trillion years, you will still have value in contrast to the secular view of nothingness. Christians do have a basis to wear clothes (to cover shame due to sin; see Genesis 2:25; 3:7 ),18 a reason to uphold marriage (God made a man and a woman; see Genesis 1:27 ; Matthew 19:4–6 ),19 a reason to be clean (Leviticus contains many provisions to counter diseases in a sin-cursed world), and a source of real love (since God made us in His loving image; see 1 John 4:8 ).20 As Christians, we have a solid foundation for saying things like back-stabbing, theft, and lies are wrong (see the Ten Commandments in Exodus 20). Feedback: Is Atheism a Religion? If one claims that God may exist or that there may be a spiritual realm, then that person is not an atheist, but an agnostic, at best. The agnostic says that one cannot know whether God exists, but how can they know that for certain apart from being omniscient themselves? Additionally, the Bible says in 1 John 5:13 that we can know for certain that we have eternal life. So an agnostic—who claims we cannot know—does not hold a neutral position regarding the biblical God. Keep in mind that Christians, including me, do fall short due to sin and the Curse, but God never fails.